Review | "Middle of Nowhere"
2012 has seemingly been a banner year for indie success stories. As Patrick Wang's brilliant In the Family made its triumphant return to theaters fueled by strong word of mouth and rapturous reviews, Ava DuVernay's Middle of Nowhere became a model for DIY distribution, carried along by grassroots support and an endorsement from Oprah herself. Middle of Nowhere is the latest from the African American Film Festival Releasing Movement, a coalition of organizations dedicated to supporting black filmmakers and advancing black cinema as a whole. DuVernay's first film, I Will Follow (a film I admittedly did not give the consideration it deserved at the time) was also AaFFRM's first release, and it exemplified the can-do indie aesthetic of this scrappy young organization. DuVernay has clearly graduated from her more humble beginnings, however. Her budget may still be modest, but she has proven you need neither a big budget or the support of a well known distributor in order to make a successful film. All you really need is determination and talent, both of which she has in spades. David Oyelowo as “Brian” and Emayatzy Corinealdi as "Ruby" in Ava DuVernay's Sundance award winning MIDDLE OF NOWHERE. Courtesy of AAFFRM. DuVernay became the first black woman to win the Best Director award at the Sundance Film Festival for Middle of Nowhere, and it's easy to see why she won. It's a remarkable example of understated emotion and unspoken grace. The central character is Ruby (Emayatzy Corinealdi, in a revelatory performance), once a career driven woman, who drops out of medical school when her husband, Derek (Omari Hardwick), is sent to jail in order to fight his conviction and secure his early release. Their relationship takes on a new timbre, and endless parade of bus anonymous bus rides and colorless cinder block walls. With a table permanently between them and a guard at the door, they become lovers from a distance, once a week. And so it goes for four years, day to day, just trying to get by. But something changes as Derek's parole hearing approaches - a shocking revelation that not only changes how she sees Derek, but how she views their entire relationship. Pulling away from Derek to reassess the direction of her life, she finds herself drawn to Brian (David Oyelowo), a kind hearted bus driver whose quiet masculinity could not be more different than the more testosterone fueled Derek. As Ruby finds herself caught between two men and the paths the represent, she is forced to make a choice between a new life and her old one. "There are no easy answers," she says. And the direction she chooses will change her life forever. 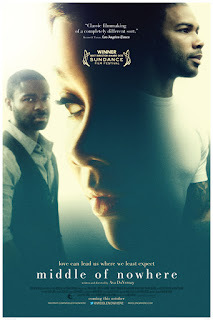 Omari Hardwick as “Derek” and Emayatzy Corinealdi as "Ruby" in Ava DuVernay's Sundance award-winning MIDDLE OF NOWHERE. Courtesy of AAFRM. It may sound a bit like a soap opera when spelled out on paper, but under DuVernay's sensitive direction it is anything but. It's a soulful, lyrical film that explores the vast gulfs that exist between people, even those we think we are closest to. Her script seems to exist in the silences, in the words left unsaid, the glances and the distant memories that flutter to the surface when they are least expected. The real heart and soul of the film, however, is found in Emayatzy Corinealdi's tender performance. Her face conveys such pain yet such resilience that you can't take your eyes off her. Corinealdi, whose biggest previous role was a recurring character on The Young and the Restless, is something truly special. The film is as much her's as it is DuVernay's, and the result is utterly mesmerizing to watch. As an African American woman, DuVernay's perspective is sadly something rare in film, which is part of what makes her such a unique voice. She takes black cinema in a direction that completely eschews the feel-good sermonizing and stock characters of Tyler Perry (who I have always been a fan of, but DuVernay aims higher and goes deeper) and the broad, lowbrow comedy that black actors are so often relegated to in Hollywood. But more than that, Middle of Nowhere transcends race. It is clearly made from a unapologetically African American (and female) perspective, but it strives for something beyond racial divisions. I know what you're thinking - it's easy for a white, male critic to anoint a film as post-racial, to say that race doesn't matter in the Obama era when it clearly still does to a great many people. But love is universal. It is not uniquely black, white, Asian, or Hispanic. And DuVernay is clearly not just making films for African Americans alone. She is speaking to everyone informed by her own deeply personal perspective. That makes Middle of Nowhere something exciting indeed. In an industry that is still overwhelmingly white and male, despite the rapidly changing demographics of America (a lesson the Republican party learned the hard way this past election), the film feels like a quiet roar of defiance; a haunting and exhilarating new direction for cinema, boldly exploring people and themes left untouched by the mainstream establishment, with DuVernay as its powerful new voice. Middle of Nowhere is a film to be celebrated. MIDDLE OF NOWHERE | Directed by Ava DuVernay | Stars Emayatzy Corinealdi, David Oyelowo, Omari Hardwick, Lorraine Tossaint, Dondre Whitfield, Maya Gilbert | Rated R for some language | Now playing in select cities. Review | "How to Survive a Plague"
Review | "In the Family"
Review | "A Late Quartet"
Blu-Ray Review | "Abraham Lincoln"
Blu-ray Review | "In the Mood for Love"
Review | "In Another Country"